"In the beginning I lived in Bisesero. I met my wife and fell in love right away. We came here to find work. A woman hired me to plant trees. Among many I was chosen for the job of caretaker here. 'You can stay here, work for me and cultivate this land," she told me. " I keep the place clean and beautiful. What gives me joy is seeing my family every morning and working for thier well being. Life is hard but we live by the lake and everyday we can get fish- Ndugu and Sambaza- Ndugu are not tasty but good for the children. Sambaza are best for the taste. I am happy living in a beautiful place where people stop to speak with us. Some even take pictures and show me the screen and say 'Look- you live in such a beautiful place.' I want to marry my wife but for that we need money. It'll cost a bit - 12,000 Francs ($18) for a civil ceremony. 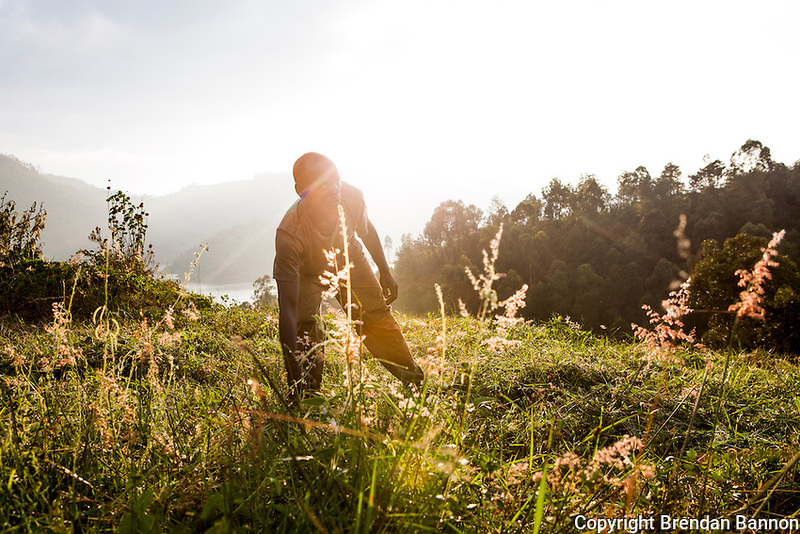 But with 50,000 Francs ($74) we could go home after and share drinks with friends and wear new clothes" - Aphrodise Bakunzibacye Kibuye, Rwanda. Lake Kivu shore. Photo by Brendan Bannon March 1, 2014.